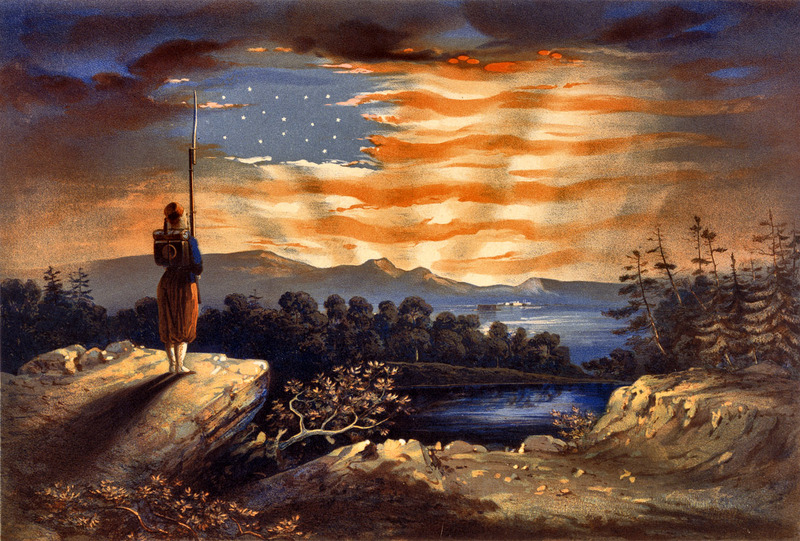 Our Heaven Born BannerPatriotic print based on Frederic Edwin Church's small oil painting "Our Banner in the Sky"
Yet another flurry of transactions led to right-hander Bradin Hagens starting the game in front of a record DBAP crowd. Hagins had a couple of starts at AAA last year in Reno for the Diamondback franchise. He was up from Montgomery a couple of weeks ago for a couple of innings in relief, then he went back. He did just fine (Game Score = 62). Plus he got home runs from Richie Shaffer, Taylor Motter, and J.P. Arencibia before he left the game after five innings. After all our complaining about the starting pitching over the last few weeks it’s odd to be pointing out how poorly the bullpen did last night. After Hagens shut out the Tides for five innings, four relievers gave up five runs on 10 hits. In just one game the relievers’ ERA for the season went from 3.39 to 3.49, the worst it’s been since the very beginning of the year. Led off by José Dominguez, who gave up 2 runs in the 6th (and left two on base), each following pitcher gave up a run until in the 9th the winning run came across. Meanwhile the Bulls were baffled by a knuckleballer (Eddie Gamboa) and held runless for the rest of the game. Too bad, because early in the game we were also treated to some wonderful defensive play including a 1B (Arencibia) to 3B (Shaffer) that cut down a lead runner in the 3rd; a perfect Maile to Franklin caught stealing; and near-perfect Boog Powell (left field) to Luke Maile at home. Unfortunately, the runner was in the way and he got nipped by the ball, so the throw ended up counting as an error (something not right about that, it seems). Dylan Floro is up this afternoon. He has not done well in his last four games. Maybe today? The aforementioned Bradin Hagens is up from Montgomery. Reliever Andy Oliver has opted out of his contract and gone for free agency. Decent job for the Bulls. 25 games, 28 innings, 5 holds, 1 save. He got the win over in Norfolk Friday. Maybe he wanted to go out on a high note? More likely watching all those guys going back and forth to St. Petersburg started working on his head. Jordan Norberto was moved to the “temporarily inactive” list. Have no idea what that means. Infielder (1B) Marc Krause’s status was changed from being optioned to Durham to a Designated for Assignment, meaning he will come off the 40-man (and could possibly by claimed). That was to make room for Teaford. Reliever Ronald Belisario opted for free agency rather than come back to Durham.